Why do some very simple questions get lots of upvotes? Why do some very simple questions get lots of upvotes while some of the really logical questions get very few upvotes? On Stack Overflow I have seen dozens of simple questions (whose answers are easily available on the Internet) get many upvotes, while some very logical questions sometimes only get one or two upvotes. What should we do? The formula for "hotness" for the Stack Exchange™ MultiCollider SuperDropdown™. First is human psychology: When someone comes across a post, their attention span usually lasts less than 10 seconds before they will click away. If the question cannot capture the reader's attention within those 10 critical seconds: No vote. The same concept applies to the advertisement and marketing industry. Simple posts are easy to understand. So they are most likely to be read and understood within that 10 second time-frame. That's why they have a tendency to get upvoted more. All long posts are severely handicapped since they cannot be read in 10 seconds. So the only way they will get a lot of votes is if they capture the reader's extended attention within those first 10 seconds. Humor: It might get you downvotes, but it'll get you many more upvotes to offset them. Simple and easy questions tend to bait a LOT of answers (as a result of FGITW). 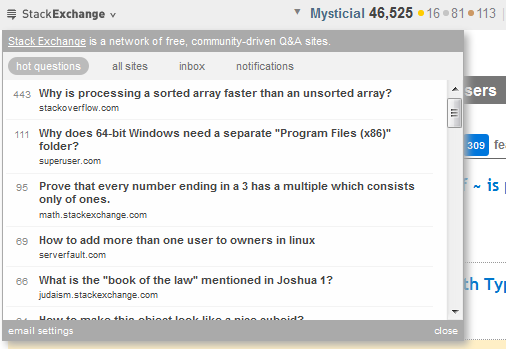 When a question gets to the top of the hot-list like that, it invites lots of views from users all over the network. And when you get a lot of views, you get a lot of votes. For hard questions with few answers, there isn't much you can do here. I've seen far too many answers that never got the attention they deserved, because there were not enough answers to bump the question up on the hot-list. Simple questions can be understood by more people. They get a lot of attention and, as such, a larger number of votes. These questions are also easier to answer. I think the simple questions get more eyes on them so there are more people who will are going to vote on them. Plus simple questions are easier to understand and answer. But the more logical questions (as you called them), might not get as many people looking at them or there might not be as many people who understand them to answer it. How some questions get so popular fast and yet die fast too? Why are the values of upvotes for simple and complex questions equal?